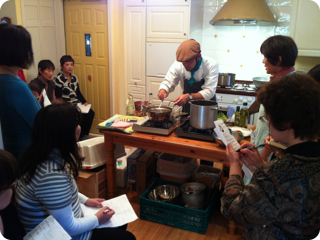 This past Thursday, one of our small groups, Sharonkai, had a joint cooking class at the home of Mrs. Harada in Meguro taught by Yuzo Narumiya. You may remember that Narumiya-san also played the sax for a concert at Denen Grace this past summer. He's also an experienced cook, having worked in an Italian restaurant, Okutama Bible Camp, and now a seminary's cafeteria kitchen. Narumiya-san taught us a wonderful new way to prepare chicken. And we all enjoyed a time of fellowship and food together. 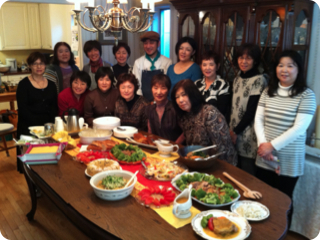 We praise God for the many gifts God has given to Narumiya with music and cooking. And we are grateful for his sharing those talents with us.